Welcome to the ThemeZee Social Sharing plugin documentation. These instructions briefly explain how to setup and configure all plugin features. The Social Sharing plugin is available to all purchasers of our Pro Add-ons and Bundles and can be downloaded at any time in your account. After you have installed and activated the plugin, please go to Settings → ThemeZee Plugins → Social Sharing and activate your license key to receive regular updates. The Social Sharing plugin comes with a bunch of settings which allow you to adjust the social sharing feature to your needs. 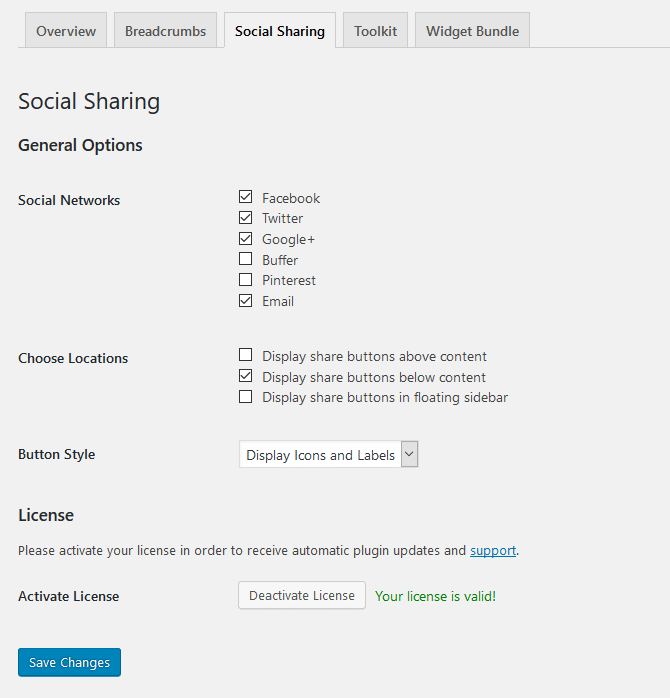 You can configure these settings on Settings → ThemeZee Plugins → Social Sharing. The Social Networks setting let you choose which sharing buttons should be displayed. Furthermore you can select the exact locations where the sharing icons should appear. The plugin supports three different button stylings by default: Icons, Labels or Icons + Labels. Please look at the next section of this tutorial for more available styling customizations with CSS. You can change the styling of the social sharing buttons with CSS code if you want. The following CSS snippets help you to get started. You can add your own CSS snippets to your WordPress website by using the Simple Custom CSS plugin.